Several papers look at the role of interactive language use in the cultural evolution of language. Iterated artificial language learning experiments have been used to study the emergence of linguistic structure. 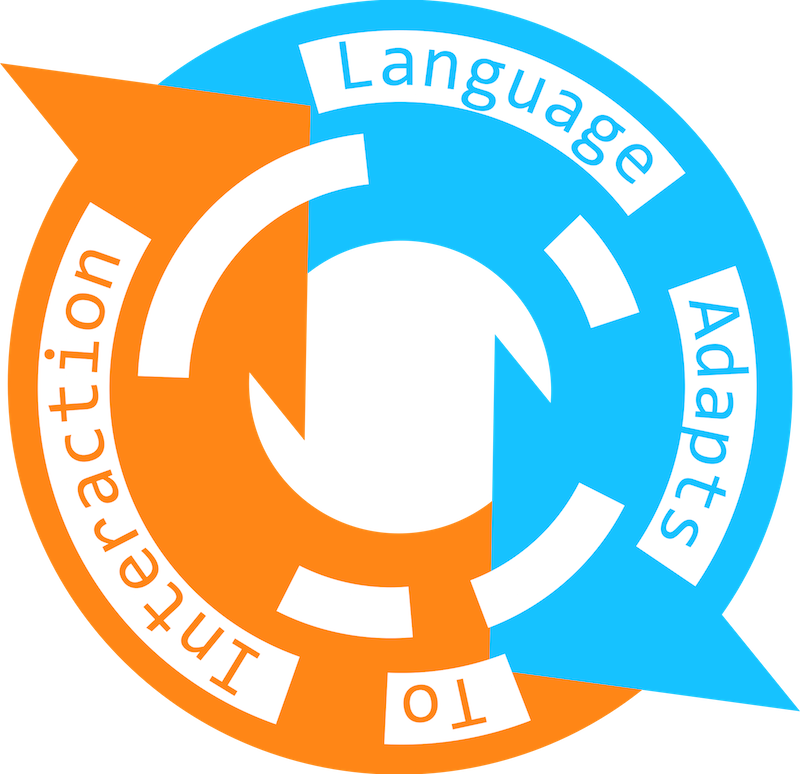 In these experiments, participants learn a miniature language and then use it in a simple interactive communication game. The language that they use gets transmitted to a new ‘generation’ of participants as their input language. This is repeated many times, and the way the language changes can be observed. Schouwstra, Motamedi, Smith & Kirby review these studies, showing that compositional linguistic structure can emerge as an optimal solution to two pressures: a pressure for the language to adapt to be easy to learn during transmission, and to be pragmatically effective during use. In this sense, the interaction between communicating participants is a crucial part of the cultural evolution of language. Macuch Silva & Roberts analyse the typical interaction phase in these experiments from the viewpoint of Conversation Analysis. They point out that, in addition to the ability to transfer information within and between generations, the iterated learning paradigm provides participants with systems for sequence organisation and turn taking,. They suggest that these can be manipulated to reveal their impact on the emergence of structure (more details in Macuch Silva & Roberts, 2016b, main conference). Similarly, Micklos digs into the developing interaction between participants communicating through silent gesture. Interlocutors re-use and transform prior gestures in their interactive history to build up a more complex system. Conventions such as repair also emerge to support communication (more details in Micklos, 2016, main conference). One important question is whether transmission between generations is necessary for the emergence of structure, or whether interaction is sufficient. Carrigan & Coppola show that agreement markers do not emerge in interacting dyads using silent gesture, mirroring early stages of emerging sign languages, and argue that re-analysis by new generations are necessary to introduce structure. Silvey, Flaerty, Goldin-Meadow, Kirby & Smith suggest that is because interaction emphasises local alignments between a particular meaning and a particular form (which leads to holistic systems), while learning emphasises global structures in the language. They demonstrate that a period of non-interactive, individual learning is necessary for the emergence of categorical structure, also mirroring findings in emerging sign languages. However, Tamura & Hashimoto find that structures emerge in certain kinds of dyadic interaction. They analyse the details of a graphical communication task to show that repeated attempts to communicate about unfamiliar concepts, coupled with the ability to repair prior turns, leads to a convention for distinguishing nouns from adjectives. Finally, two papers look at the initial emergence of the interaction systems themselves. Żywiczyński, Orzechowski & Wacewicz consider the evolution of turn taking. They find links between the timing of turn taking in conversation and adaptors (self-regulatory behaviour such as scratching), suggesting that the latter helped bootstrap the former system. Naccache reviews Levinson & Holler’s (2014) model of the emergence of multi-modal communication, and discusses the evolutionary pressures that could have set the scene for this process, suggesting that one factor could be distributed, cooperative parenting. For more details, see the EvoLang proceedings website.